Waking up tired – maybe even exhausted? If you wake up feeling like you barely got any sleep – it’s probably because you didn’t. More accurately – you probably didn’t experience all 5 stages of healthy sleep. You may have stayed stuck in stage 1 - where you’re between wakefulness and sleep...or maybe you reached stage 2 - where your brain is relaxing, body temperature is lowered, heart rate slows, and you’re no longer aware of your surroundings...but you never made it to stage 3 delta waves - where you’re transitioning into a deep sleep. Not even to stage 4 delta sleep – where restorative and healing sleep occur...or to the stage 5 REM (rapid eye movement) – where you’re in dreamland and your brain is storing the day’s memories. Without experiencing all 5 stages of sleep – you never fully relax during the night – so it’s no wonder you wake up feeling tired and wired. What can help you experience the deep, restful sleep your body needs? Neuro-Natural Sleep, a complex natural supplement specifically designed to support healthy sleeping patterns, was developed for those people who need extra support to achieve a good night’s sleep. Neuro-Natural Sleep contains a sophisticated and synergistic combination of 49 ingredients, all in a specific dosage to ensure each one works well with the others to support healthy sleep patterns. In order to protect all these ingredients against stomach acids and to ensure maximum bio-availability, Neuro-Natural Sleep is enteric-coated. Insomnia can be caused by many different factors. This product may or may not work for you. We cannot guarantee that it will fix your insomnia, but it may help you achieve improved sleeping patterns. If you are not feeling the benefits of this product after the first month, please let us know and we will give you a full refund as per our 100% risk-free guarantee. Other Ingredients: Microcrystalline Cellulose, Enteric Coating (Purified Water, Ethylcellulose, Ammonium Hydroxide, Medium Chain Triglycerides, Oleic Acid, Sodium Carboxymethyl Cellulose, Talc, Polydextrose), Dextrose, Maltodextrin, Silicon Dioxide, Sodium Carboxymethyl Cellulose, Magnesium Stearate, Dicalcium Phosphate. Daily Serving: Adults - 6 tablets. Age 12 to 18 years – 3 tablets. Take before your evening meal, or split into 2 doses per day; taking the first dose before your evening meal and the second dose around 2 hours before bedtime. Can be taken with any other Neuro-Natural product for a full dose of 6 tablets a day (E.g. 3 tablets of Neuro-Natural Sleep with 3 tablets of Neuro-Natural Serenity). Combines well with our Total Balance, Kiwi-Klenz and Omega 3 Fish Oil products. 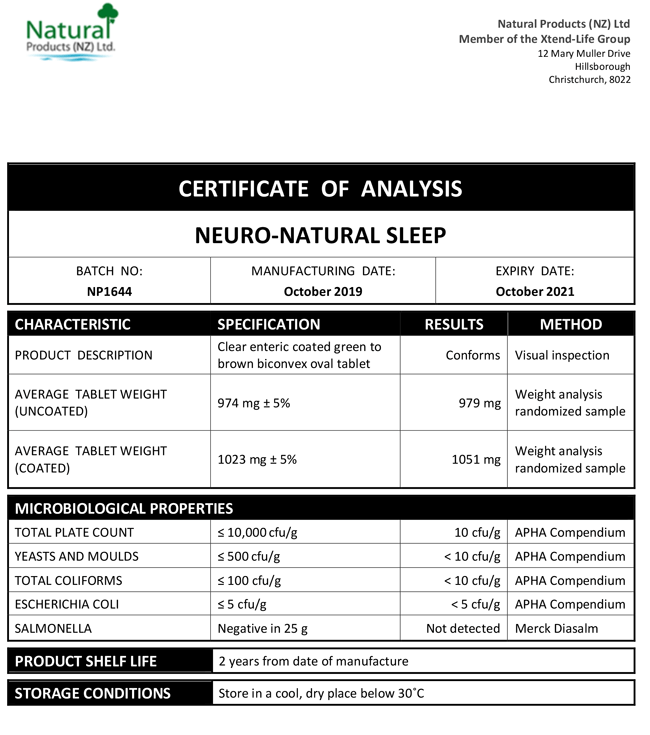 We have included below a copy of a typical Certificate of Analysis (CoA) for our Neuro-Natural Sleep product. All of the Xtend-Life Neuro-Natural Sleep products have the same formulation and standards. What benefits could I notice from using Neuro-Natural Sleep? Neuro-Natural Sleep may help you to rest more easily and, more importantly, sleep more deeply and more satisfactorily, helping your body to generate needed energy and process nutrients necessary for good health. What is the recommended dosage for Xtend-LifeNeuro-Natural Sleep? Can be taken with any other Neuro-Natural product for a full dose of 6 tablets a day (E.g. 3 tablets of Neuro-Natural Sleep with 3 tablets of Neuro-Natural Serenity). Combines well with our Total Balance, Kiwi-Klenz and Omega 3 Fish Oil products. How can I get the best results from using Neuro-Natural Sleep? To see the best and most rapid results we suggest that you follow our guidelines found under the 'Directions' tab, in conjunction with adequate physical exercise to oxygenate the body and mind, as well as a healthy, balanced diet. The recommended dose of Neuro-Natural Sleep is 6 tablets per day. To ensure your body has all the nutrients needed to function properly, we recommend including Total Balance, and also Valerian is one example of an important ingredient in this product to help support sleep patterns and one commonly used in other similar products on the market. However, Neuro-Natural Sleep offers greater benefits than this one ingredient alone due to its comprehensive formulation. Some of the other ingredients in our products are very special components. Most companies leave these ingredients out due to their cost and the fact that some of the more vulnerable ingredients must be enteric coated in order to make it through our stomach acid undamaged to the upper intestine. A good example of this is SAMe. SAMe plays an essential role in more than 100 biochemical reactions involved in the methylation process of various vitamins such as B6, B12, folic acid, and Betaine. It contributes to the synthesis, activation and metabolism of hormones, neurotransmitters, nucleic acids, proteins, and phospholipids and is therefore very valuable ingredient. Our Neuro-Natural range has the advantage not only of having these ingredients included, but it is also enteric coated, ensuring that the vulnerable ingredients are not damaged by stomach acid and optimal absorption can occur. Can Valerian root be used on its own to help me sleep? Some people notice a benefit in sleep patterns and the ability to get to sleep from taking Valerian on its own, but generally only for a short time. Not everyone even notices these short-term effects. This is because this ingredient works differently for different people when used on its own. It will be less potent long-term, despite generally higher doses (which may be incompatible for the body) when used as a singular ingredient. This is why we have used it as part of our comprehensive formula; combining it with many other beneficial ingredients achieves the best possible results. What else can I do to enhance the benefits of taking Neuro-Natural Sleep? Trying to relax and get a good sleep when you have things on your mind or feel run down or 'out of sorts' is difficult. Try to do relaxing things before going to bed, such as taking a relaxing warm lavender bath, or listening to soothing music. Don't fight insomnia should it occur as this can only make you feel worse, instead get up and do something relaxing rather than tossing and turning trying to sleep, then go back to bed when you feel more relaxed. Nutrition is also a key factor in order to ensure correct sleeping patterns are supported. Avoiding alcohol, caffeine and sugary foods close to bed time is advised, also try to eat your dinner at least three hours before wanting to go to sleep. Eating foods such as banana, yogurt, whole grains and eggs in the evening may help to encourage the production of serotonin and melatonin, both of which are crucial for healthy sleeping patterns. Will Neuro-Natural Sleep cause any side-effects? As this is a naturally based product, experiencing side effects is uncommon. However, some people may experience initial effects such as a mildly upset stomach, as your body becomes accustomed to the combination of ingredients in this unique supplement. The digestive system should soon become used to the product and settle again after a few days or a week. We recommend you persevere and drink plenty of water during this stage. Should these symptoms continue please contact us for further advice. Why should I select Neuro-Natural Sleep over the other three versions? Neuro-Natural Sleep is formulated to benefit those who need support to help balance their sleeping patterns. It contains specific ingredients to help bring about relaxation and rebalance the brain and nervous system, allowing deeper, more satisfactory sleep periods. It may support the nervous system to bring about reduced feelings of stress, and frustration… and also help to improve your sleep. Can I take Neuro-Natural Sleep at the same time as one of the other products in the Neuro-Natural range to support my stress levels? We do not generally suggest taking more than one Neuro-Natural range product at a time. Neuro-Natural Sleep is good to take if you are currently suffering from bouts of insomnia, or if you have a chronic sleep problem, or even if you do sleep but wake up unrefreshed, which may be due to a restless sleep period. If the cause of poor sleep is related to an issue such as stress or anxiety, then our Neuro-Natural Serenity formula would be a good product to try, as it may help address the root cause. Once this is has been addressed and if you feel additional sleep support is still required you may introduce to Neuro-Natural Sleep as well. You may also take half a dose of each product at the same time. You could take half the dose of Serenity before dinner and then a half dose of Sleep two to three hours before bedtime to target both concerns. What you decide to do really depends on your individual circumstances and the degree of your condition, and importantly the underlying cause of your condition. Please do not hesitate to contact us if you require individualized assistance. Will Neuro-Natural Sleep help with my stress, busy life and emotional difficulties? Yes, it is possible you will notice a difference. Modern day living and the stress that accompanies it, along with more complicated lifestyles and less time for balanced nutritional intake, all lead to sleeplessness and irregular sleeping patterns. Neuro-Natural Sleep may help you to achieve better sleep in order to be strong enough, both physically and mentally, to deal with these issues. So the formula can work both ways. If you have any questions or need help in choosing the best product for your needs please do not hesitate to contact us.